We all know the story of Noah, who built an ark to save his family from the flood. 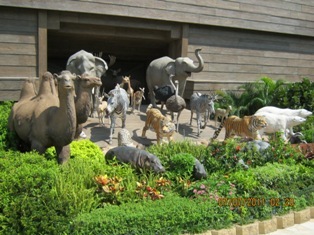 This time, my family and I were able to see a replica of the ark with our own eyes. 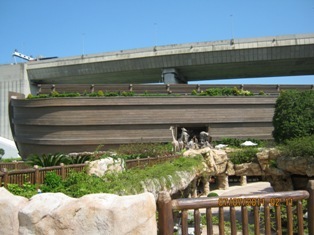 We took trains and a bus to an island called Ma Wan, where the Noah’s Ark Park was located. After buying tickets, we went through a gate to step into the park. I glanced around and spotted a huge structure. It was the Ark! I gestured to my family to look at this gigantic boat. Yes, it was very large as the authority claimed that they followed the exact measurements of the Bible to build it, but somehow it looked smaller than what the Bible described. Inside, we read information about the real Ark. As compared to other big ships like the Titanic and huge cargo ships or cruises, the Ark was the best in terms of safety and stability. Why? It was because our God was the Greatest Builder of all. We also studied documentaries in the exhibit hall and learned that a group of Christians from Turkey and Hong Kong explored Mount Ararat and claimed that they found the real Ark in 2010. They bought back ropes, nails and pieces of wood. How amazing! As our visit continued, we saw a 4-D movie that played how Noah and his family were saved from the flood and that all other people died. These people did not believe God and were evil in the eye of the Lord. When they realized that the flood was actually coming, they wanted to get into the boat, but it was too late. I pray that all non-Christians may come to their senses and accept Jesus as their personal Savior before the door closes. Come to the Ark before it is too late. This entry was posted on Wednesday, July 27th, 2011 at 11:30 pm and is filed under Short Stories. You can follow any responses to this entry through the RSS 2.0 feed. Both comments and pings are currently closed. What a nice testimony! Your visit to Noah’s Ark sounds awesome. You relate it very well.